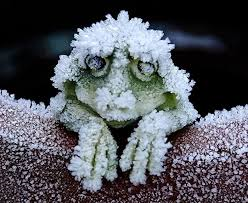 My friend, Jessica, and I saw a picture of a frozen frog called an Alaskan wood frog. We decided to write different perspectives of the same picture. I wrote about the ice covering the frog and you can read that story here. Jessica wrote about what may go on in the frog’s life when the frost comes. Her story is this week’s blog, below. Enjoy! I looked at him and he only shrugged. It isn’t always easy getting accustomed to the flood of sugar that comes into an Alaskan Wood Frogs body when their feet get cold. Winter is coming and I started to wonder when Frost would get here. I couldn’t help but watch Echo ping pong his way up a tree. He screamed at the top. West and I laughed. “Pine needles hurt don’t they Echo.” Mud shouted. The three of us were funny friends, Echo made us a group of four. The only three types of frogs and toads in Alaska. West is a Western Toad. No, not all of them are named West. He is the biggest of the three of us. He likes to spend his winter sleeping in abandoned burrows. Last year’s home we chased a fox out of her den. Don’t ask. I would apologize for it if I knew she wouldn’t eat me. Then there is Mud. He’s crazy. Mostly when he starts drying out and twitches until we find water. So he doesn’t leave the lake too far behind. He sleeps in the mud at the bottom of the lake when Frost freezes the top of it. I’m excited. This is the first year we are hibernating so close together. “Ugh.” All of the wind rushed out of me. My nose was pushed deep into the moldy fall leaves. The ones that turn all brown and wrinkled. It was great. I didn’t want to get up. “Hey Woody, you can’t sleep yet. Frost isn’t here.” Echo came nose to nose with me. I grunted all the way up. “Why you…” I made a fist. He and Mud disappeared up the tree. Echo jumped to join them but tripped over a pine cone. She was going to eat him. I landed on top of Echo just as a clawed paw grabbed me. She didn’t eat me or kill me. Great. A fox who likes to play with her food. Her big round eyes were staring into mine. Her coat was starting to turn white from the normal gray. She looked familiar. “Uh. Oh.” My heart beat so fast it was going to come out of my chest. “Uh oh is right.” She let me fall to the ground and pinned me under a furry fist. “I thought that was you. Last year you destroyed the den that my family has returned to for seventy-five years. Something I’m sure you can’t even think about because four years old is about all you live.” Her hot breath almost thawed out my hands. “If Grandpappy lives through the winter he will be five. So there.” She looked up into the tree, sharp teeth showing when she smiled. “I wasn’t that worried to find a house,” West’s deep voice held an edge. “He did try and talk me out of it.” She pushed down a little harder. There would be a frog-shaped dent in the ground soon. “Piper, you should let him breathe so he can tell you something.” Frost touched her ear and it turned the color of fresh snow. Piper shook her head and backed away. She rushed over to the large rock we jump off of when we swim in the summer. “Frost, what’s wrong with her?” I looked at my blue friend. Mud came screaming out of the tree. “I can’t take it anymore. It’s too dry. Have a good winter guys!” The lake surface barely moved and Mud was gone for the cold season. “I’m going to bed too,” West yawned. “Frost has turned it too cold out here for me.” The rock in front of his hole clicked into place. The wind howled past my head. I had seen jets in the sky and knew this is what it felt to ride one. Piper skidded to a stop. “Why are we here Frost?” The leaves were perfect to sleep in. Soggy. Wet. Like a pillow. Piper turned to leave. A spring was now in her step. It was going to be a good winter, but for once, I was excited for the hope of spring. This looks great Robin! It was fun to do together! Thanks!